Hiroaki Ishiura and Yuji Tachikawa, the crew of the #38 Zent Cerumo Lexus RC F, are the winners of Suzuka 1000km race, the sixth round of the Japanese Super GT Series. Lexus recorded a double triumph as the #36 au Tom’s car, driven by Nick Cassidy and Daisuke Ito, take the second place, passing the finish line just 1.242sec behind the winners. 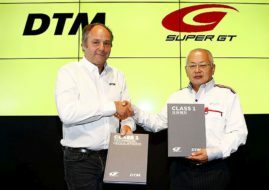 The GT500 podium was completed by Satoshi Motoyama and Mitsunori Takaboshi, who drove the #46 S-Road Nissan GT-R. 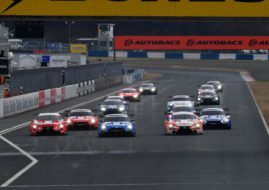 The championship leaders Tsugio Matsuda and Ronnie Quintarelli were in the fourth place until the last lap but their #1 Motul Autech Nissan GT-R then stopped, so they dropped to the sixth place. They remain in the championship lead, eleven points ahead of today’s winners Ishiura and Tachikawa. The winners in the GT300 class are Takuto Iguchi and Hideki Yamauchi, the crew of the #61 R&D Sport’s Subaru BRZ. Koki Saga and Yuichi Nakayama, who drove the #31 apr Toyota Prius GT, finished second, less than a second ahead of #0 Gainer Tanax Nissan GT-R Nismo GT3, drivern by Andre Couto and Ryuichiro Tomita.